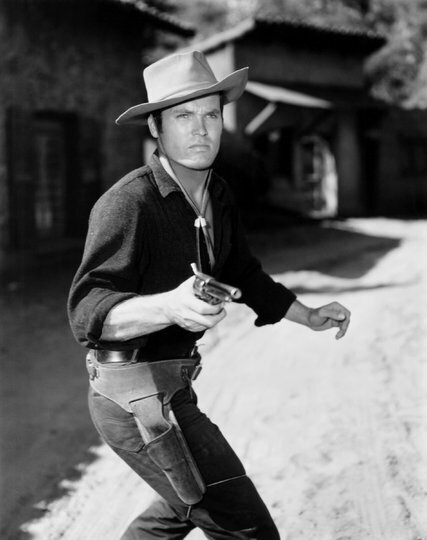 Ty Hardin was best known for his role as the gunslinger Bronco Layne. CreditWarner Bros.
Ty Hardin, who roamed the West searching for adventure in the television series “Bronco” in the late 1950s and early ’60s, died on Thursday in Huntington Beach, Calif. He was 87. His wife, Caroline, confirmed his death, but said the cause had not been determined. In a television landscape crowded with gunslingers like Sugarfoot, Cheyenne, Lucas McCain (the Rifleman) and Bret Maverick, Mr. Hardin carved a niche playing Bronco Layne, a soft-spoken loner slow to anger but quick on the draw and skilled in the saddle. “There ain’t a horse that he can’t handle, that’s how he got his name,” a line in the show’s theme song went. First introduced on the series “Cheyenne” in 1958, Bronco, formerly a captain in the Confederate Army, held various jobs as he traveled — Army scout, deputy sheriff, wagon-train master, undercover post-office agent and miner among them — and encountered colorful historical characters along the way, notably Billy the Kid, Wild Bill Hickok and Jesse James (played by James Coburn). Mr. Hardin was born Orison Whipple Hungerford Jr. on Jan. 1, 1930, in Manhattan. His parents divorced when he was 2, and his mother, the former Gwendolyn Burnett, took him and his brother to live in Houston and then at her mother’s farm outside Austin, Tex. His grandmother gave him the nickname Ty. After graduating from Lamar High School in Houston he attended Blinn Junior College in Brenham, Tex., on a football scholarship and studied for a semester at the Dallas Bible Institute. He enlisted in the Army and, after attending officer candidate school, underwent flight training and flew light aircraft while stationed in West Germany during the Korean War. After leaving the Army, he studied electrical engineering at Texas A&M, where he played tight end for Bear Bryant. A few weeks before graduation, Mr. Hardin left college to work as an acoustical research engineer at Douglas Aircraft in Santa Monica, Calif.